Mimi, happy after she stayed on Magic Island! Alafia State Park, next stop, and we were excited to get back into mountain bike mode. 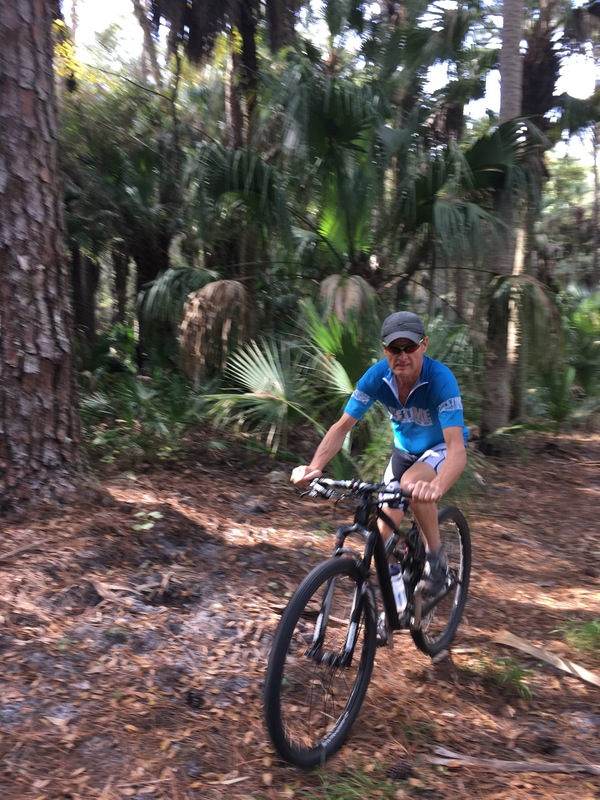 Alafia (pronounced ah-la-fee, as we learned from locals) has a system of epic trails so labeled by the International Mountain Bike Association (IMBA). We arrived and set up camp on the small 30-site campground. The park has electric and water, but the restroom/shower building is undergoing rebuilding. Portable shower and toilet stalls provided, but they are pretty smelly. Time to use our own toilet and learn how to dump the wastewater. We are still using the campground toilet for solid waste and showers, to get our camping money’s worth (!) and to save on space in our tank, eliminate having to dry out the shower curtain and basically make it easier on ourselves. Sunset from our campsite, or Here come the mosquitos! 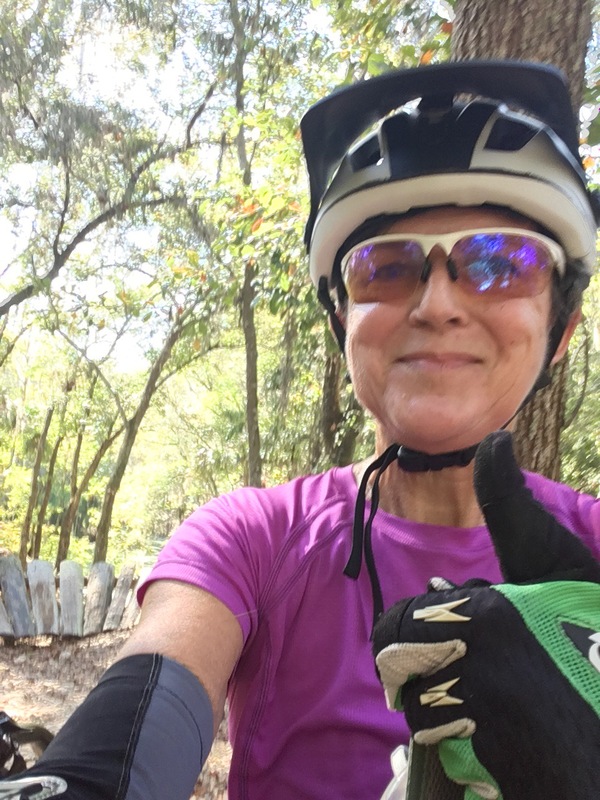 The riding at Alafia is varied and you can get a good ride in right from the campground. River Run, easy, followed by Rock Garden, Is a great warm up. Most of the blue, intermediate, trails here would likely be rated advanced at other places. North Creek and Rollercoaster are the easier – flowy, drops that aren’t too drastic and ride-arounds for the really tough stuff. 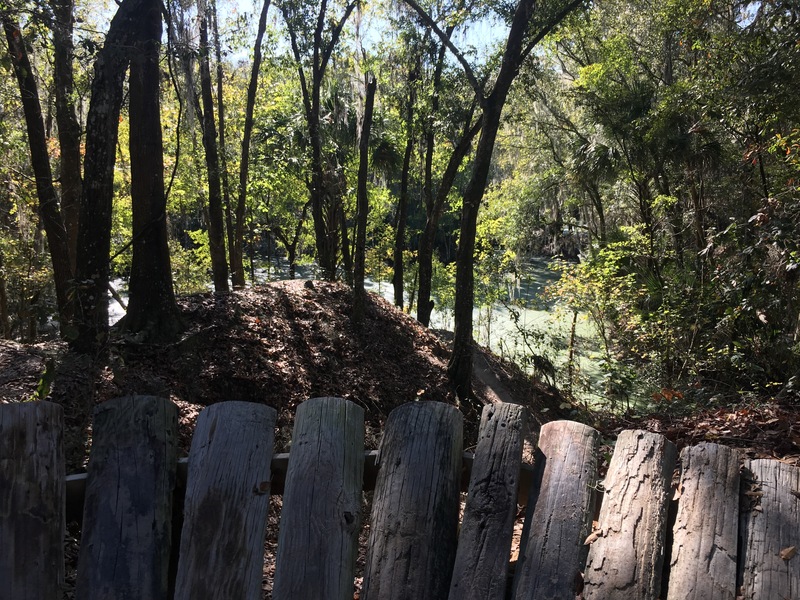 Twisted Sisters and Magic Island not so much – narrow, steep downs and ups, bridges and twists and turns with alligator swamp right over the edge. Here is where Mimi hugged a wall to save herself, and was darned glad it was there! The black diamond (difficult) are not for the faint of heart – Bob did a good job conquering many of them – and we guess the double black (expert) are for the full-faced helmet daredevil crew.